For over 800 years in Japan's Fukushima prefecture there existed an event called Soma Nomai festival. Here men on horseback compete in traditional samurai armor, katana in hand, ferociously racing through a track that extends a kilometer. This spectacle, which routinely draws photographers nationwide, is rich in action and color- however photographer Kennedy Everet Brown chose instead to create a body of work which links the past and present through quieter portraits using traditional wet-plate photographic technique. The forty-four portraits which make up the first half of this book each required a ten-second exposure time which this technique necessitates. This approach renders the subjects, here riders clad in samurai fashion, a poetic visual tribute to the past that transcends time. In striking contrast to these portraits which evoke photography's earliest days, the vibrant second half of Japanese Samurai Fashion provide the viewer with crisp interpretations and configurations of the riders' finely detailed and colorful costume. This combination of wet-plate and digital photography vividly convey the way in which wabi-sabi and hare (the sacred) exist in Japanese culture. 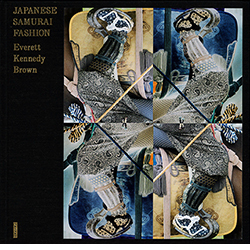 This book is a rich resource for anyone with an interest in the Japanese samurai aesthetic.